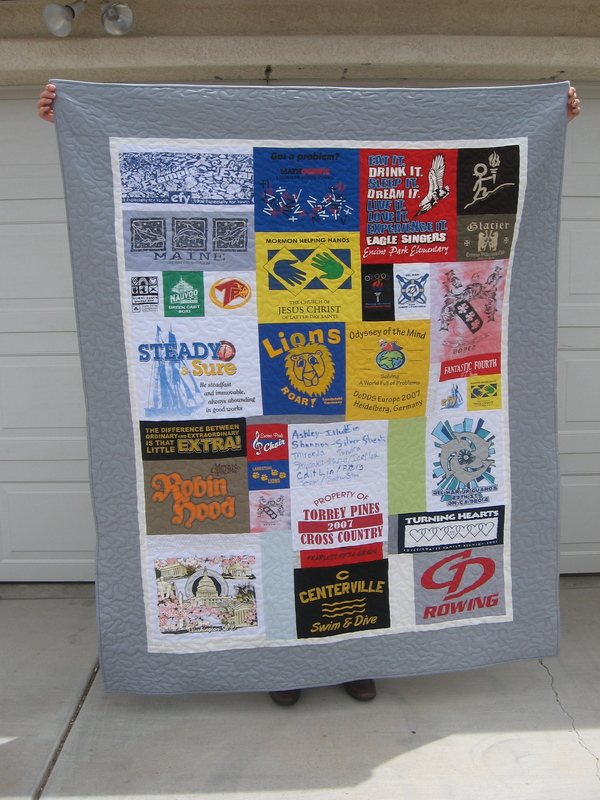 In addition to longarm quilting, I also make T-shirt quilts from start to finish. I make them collage style using only your t-shirts, no sashing. How does this work? All you have to do is send me your T-shirts and I can do the rest! Step 1: Contact me at em.sess@gmail.com and let me know that you have T-shirts to send. Indicate for what or whom the quilt will be and how many T-shirts you have. I will give you an estimate on the price and time it will take for me to complete your quilt. NOTE- It’s hard to know exactly what size your quilt will be based only upon the number of T-shirt you have. Sometimes I only really know once the T-shirts are cut and laid out. If you have a size in mind, tell me ahead of time and I can enlarge or minimize your quilt to a certain degree by adding solid blocks of your T-shirts or by taking out a few T-shirts. I can even add a solid border (as seen below in the example) to help enlarge a quilt with too few T-shirts for an extra charge. Step 2: Decide on a backing and binding color. (I can use any solid color that you like, cotton or flannel) These can be the same color or contrasting colors. Send a swatch if you want to be specific. You can also let me know what type of quilting design you’d like. I always do an allover pattern across the quilt- no custom quilting here. Step 3: Wash and dry all of your T-shirts to prep them for cutting and quilting. DO NOT CUT any of your T-shirts for me. Allow me to do all of the cutting and piecing. Step 4: ALL of the logos and designs on your T-shirts will be used in the quilt unless you specify otherwise. Mark an X with masking or blue painters tape over the designs on the T-shirts you would not wish to have included. Step 4: Mail your T-shirts UNCUT and wrapped in plastic inside the box. Always ship using UPS or FedEX for your protection. Step 5: Half of the total of the quilt is due before I begin. You can either include a check with your T-shirts or make a payment to em.sess@gmail.com on Paypal. The balance will be due before the finished quilt is shipped back to you. These prices include everything: backing and binding material, quilting, return shipping, and a border if you prefer one. If your quilt size falls between sizes, you will go up to the next size.